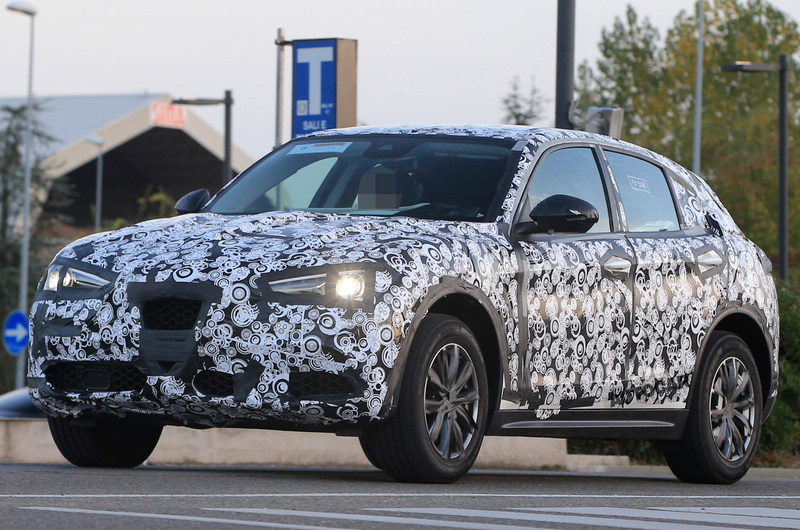 The upcoming Alfa Romeo Stelvio has been spotted in light camouflage, offering the best glimpse of its body shape yet. Previous development cars have worn heavy cladding, but today's sighting clearly shows the mid-sized SUV's coupé roofline and lengthy bonnet. These latest shots also show the shape of the rear lights, which are of a similar design to those on the Giulia saloon. The Stelvio will possibly go on sale some time early next year. Alfa Romeo CEO Reid Bigland has said it will be a driver's car. We will get our first full look at the Stelvio at the LA motor show later this month. "The reason people will buy our mid-sized SUV is because they will get blown away by the driving dynamics," Bigland told Autocar last week. "Every car Alfa makes must stand apart for that reason, and this car will not disappoint." Bigland said that the arrival of this mid-sized SUV - the Stelvio name is yet to be officially confirmed by Alfa - is something that reflects market demand. "The whole world is gravitating to SUVs. A few years ago an Alfa SUV would have been sacrilegious, but now it makes perfect sense," he explained. "Our job is to keep an eye on consumer preferences and give people what they want." Last month a video was posted on Fiat Chrysler's YouTube channel with a clip of a Stelvio in production form. The video was swiftly removed, suggesting it was published accidentally, but Motor1 captured a screenshot - it's shown below. Motor1's image shows the car in what looks to be entry-level form due to the fitment of small diameter wheels. It clearly shows the car's nose and coupé roofline. Before the latest test car sightings, chassis test cars were seen wearing a chopped-about Fiat 500L body (shown in earlier pictures). The Alfa Romeo SUV will share parts with upcoming Fiat and Jeep medium-sized SUVs and use the same basic structure, although engines and transmissions will differ. It's expected that the three brands will allow FCA to cover a broad spectrum of the SUV segment. Jeeps will be the rugged off-roaders, Fiats will mix some off-road ability with on-road practicality and Alfa Romeos will offer the highest performance. It's thought that the crossover will share its engines with the Giulia saloon, meaning 2.2-litre diesel and 2.0-litre petrol engines are most likely to be available in various states of tune. The twin-turbocharged 3.0-litre V6 from the range-topping Quadrifoglio could also feature in a hot model with as much as 503bhp. This is the model that would be angled most directly at Porsche's performance SUV line-up. Inside, the model is likely to get a dashboard that strongly resembles that of the Alfa Romeo Giulia - unsurprising considering that the Stelvio uses the same Fiat Chrysler Automobiles (FCA) modular underpinnings. FCA's modular platform will later spawn a larger, BMW 5 Series-rivalling model, which will in turn be followed by two more 'utility vehicles', one larger than the Stelvio and one smaller. Two further 'speciality' models will then complete Alfa Romeo's product plans. Alfa Romeo is yet to confirm a release date for the Stelvio, but it is expected to be launched at the start of 2017, with UK sales kicking off in the late autumn or winter. It is likely to be a rival to the BMW X3 in its most basic form, with the Porsche Macan a key target for Stelvios running more potent powertrains. With this in mind, expect pricing to start close to £40,000. Alfa Romeo CEO Harald Wester has previously hinted at the importance of entering the crossover market, telling Autocar: “You can remain pure and ignore the crossover trend, but if you do, you can look forward to a beautiful death." The new SUV is one of several Alfa Romeo models that have been pushed back or delayed. FCA's original plan called for seven new Alfas following the Giulia to be on sale before 2018, but in a presentation to investors in January, FCA confirmed that the planned product range would now not be completed until 2020. Already looking better then the regular 500L. Already looking better than the regular 500L. That's hardly much of an achievement though is it? So which highly regarded 1750tbi engine is being referred to ? All the reviews I've read have complained it was a decidedly average motor even for a 4 cylinder turbo with very little 'personality' . That is no Alfa, this is a FIAT 500 derivative... If it is an AR, then it is one more wrong step... like the Gulia that falls short of expectations being just a reminiscent of a 3-series imitation... Pity, the brand stays behind competition for years now... i used to buy AR but I stopped for various reasons, but the looks was not one... now they loose also the looks??!! FIAT GROUP needs desperately new CEO and new designers!!! Ehh, what? The Giulia falls short being just a 3-Series imitation? First the moaners complain that Alfa don't do RWD any more. Then Alfa do RWD again and it's "a 3-Series imitation"... You just can't win with some people.. This is a test mule using 500L body parts as a disguise... Is that not obvious????... I give up.. It sits on a modded Giulia platform, its deffo no 500 derivative. Totally agree with you about everything else, AR looks are bad now.